You'll be £12.99 closer to your next £10.00 credit when you purchase Awards of the George Cross. What's this? In 1940, King George VI, deeply impressed with the heroism of servicemen out of the front line and civilians non-combatants in acts connected with the war such as bomb disposal, rescues after air raids, instituted the George Cross for ‘For Gallantry’ away from the heat of actual battle. In 1942 the GC was awarded to Island of Malta. Among the many inspiring stories, many posthumous, are those to Violette Szabo and Forest Yeo-Thomas of SOE. 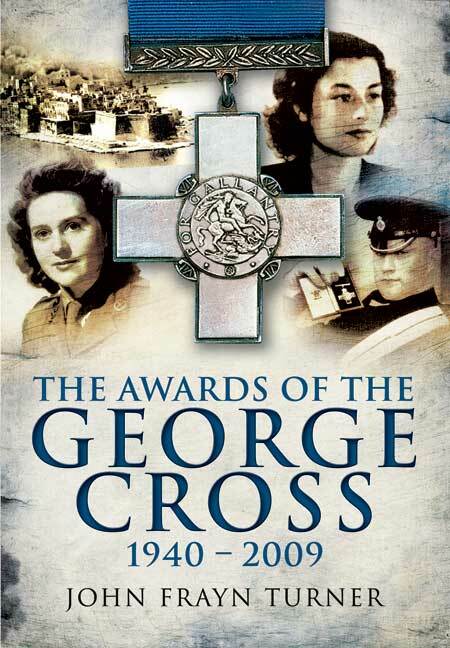 This inspiring book is the only one to describe the deeds of all recipients of the George Cross right up to the present day. The George Cross is the non-combatant equivalent of the Victoria Cross, so far awarded for supreme acts of gallantry to 159 brave men and women, many of them civilian, and to the entire island of Malta. John Frayn Turner's book commences with the story of Flight Lieutenant John Noel Dowland and Leonard Henry Harrison, both awarded the medal in 1940 for saving two vessels from ordnance which had hit but which had failed to go off, and ends after many other equally heroic deeds, The most recent recipient, Lance Corporal Matthew Croucher, threw himself on to a grenade during a reconaissance mission in Afghanistan, after hitting a tripwire. His quick and selfless action saved the lives of his colleagues, and remarkable he walked away with minor injuries. It's not often a book that will make you feel humble when reading it- this is an exception. A well-written, well-produced and reasonably priced book. Turner has researched the acts of bravery resulting in the award of the George Cross, given for extreme bravery other than in battle, to service personnel or civilians. He has gone beyond the basic facts and given us vivid accounts of the acts of heroism involved. There are photographs of some of the recipients, who may well be remembered locally. Thus, a train driver (Gimbert) and fireman (Nightall) moved a burning train loaded with explosives away from the village of Soham in Cambridgeshire. Gimbert is remembered in Soham and has a locomotive named after him. In September 1940 King George VI instituted the George Cross. It was to be awarded “For Gallantry” to both civilians and service personnel away from direct combat. Since then it has been awarded 160 times directly and 244 times indirectly. The latter category consists of personnel who were awarded the Empire Gallantry Medal, the Albert Medal or the Edward Medal and were eligible to exchange their award for the GC. In the book there is an Appendix stating the names of the indirect recipients whereas all the direct awards are featured. This interesting book details the actions in which all of the 160 direct GCs were awarded. It is organised on a chronological basis. The first chapter starts with those awarded for 1940 and the subsequent chapters cover the period up to 1947 on a yearly basis. The final four chapters cover 1950, 1960-70, 1971-77 and 1989 – 2009. The recipients of the GC are split roughly one third for civilians and two thirds to service personnel. Although the GC ranks alongside the Victoria Cross (VC) it is by far a lesser known decoration. It has been awarded on significantly less occasions than the VC so in real terms it is much scarcer than the VC. It is still “in issue” and the latest bestowal recorded in the book was in early 2008. The text starts with the initial awards of this exceptional medal earned during the Blitz. Members of Bomb Disposal Teams feature highly amongst those awarded as they undertake these specialised and highly dangerous assignments. Civilians too are featured – there are examples where rescuers during the Blitz tunnelled in the rubble of cities to rescue those buried underneath. There are other accounts of selfless courage from service personnel, Air Raid Precautions, Fire Service, Railway personnel, Home Guard, Police, Merchant Navy etc to name but a few. The book gives details of the “group” awards. The Island of Malta features amongst these as the award was given to the Islands’ population in recognition of their outstanding heroism and devotion. There was a similar award for supreme gallantry to the Special Operations Executive (SOE). Perhaps the most unusual bestowal of this medal was to George Anthony Taylor who was a Volcanologist. He exhibited extreme courage during the eruption of the Mount Lamington volcano in Papua during January 1951. Another fascinating and unusual award was to Barbara Jane Harrison a Stewardess on British Overseas Airways Corporation (April 1968) who died whilst saving others during an aircraft fire. Both of these courageous individuals’ acts are recorded in the book. For anyone interested in gallantry medals this is a “must have” book - it details all the acts of extreme courage that have earned this most prestigious medal. It will enthral the reader right from the first page up to the last page. Congratulations should go to the author for producing this exceptional text. [The book] looks at those who have won this award for civilian gallantry, which complements the Victoria Cross. There is a complete list of recipients with an account of why the award was given for a selected number. In September 1940, King George VI instituted the George Cross for non-combatant gallantry by men and women. This book by John Frayn Turner describes each act of selfless courage by each of the 160 recipients of the award. This inspiring book is the only one to describe the deeds of all recipients of the George Cross right up to the present day. Here are the true stories of some real heroes. Recommended! The George Cross was awarded to the island of Malta by King George VI in a letter dated 15 April 1942 to the island's Governor Lieutenant-General Sir William Dobbie, so as to "bear witness to the heroism and devotion of its people" during the great siege it underwent in the early parts of World War II. The George Cross is woven into the Flag of Malta and can be seen wherever the flag is flown.